The Ossur Pro-Flex XC is one of the newest designs in prosthetic technology for below the knee amputees. Developed to comfortably accommodate a large range of activity levels, the Pro-Flex XC is a reliable and flexible prosthetic ankle solution that easily adapts to your lifestyle whether you’re an active user who likes to do fast walking, heavy-lifting, and recreational sports, or if your day-to-day routine involves more low activity levels such as gentle, steady walking with or without a walking aid and moving around in the home. Some notable features of this prosthetic ankle include the use of Active Tibial Progression that stores and translates vertical motion, reducing the need for the user to actively push the body forward and also helping to equalize stride length, and Carbon-X Active Heel technology, which is an energy storage and release mechanism that allows for forward progression of the limb, reducing impact to the joints and residual limb and thus increasing comfort. 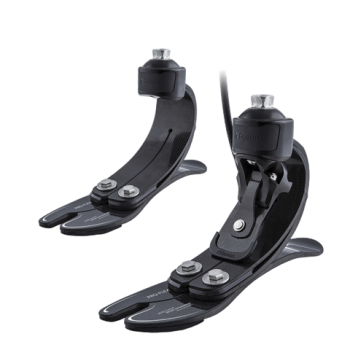 Users will find that in comparison to the original XC, the dynamics on the latest model of the Pro-Flex XC Ankle are upgraded due to two factors: the attachment point of the heel spring and improved positioning of the pyramid. The Pro-Flex XC adds minimal weight to your prosthesis and its simple mechanical design means it’s reliable, easy to use, and there are no batteries to worry about. It also comes with an aesthetically pleasing, anatomical footcover in both split toe and sandal toe designs which provide the benefits of better visual appeal, functional compatibility with different types of shoes, and increased balance and stability.